Bulldozers, scrapers and graders are used to prepare the surface of newly developed lands, fill pits and cut particular heights, hillocks and ridges. Final leveling of ploughed field surface is performed by using special machines: land levellers and smoothers. Harrows, cultivators, compactors and combined machines are used on old-arable lands to level ploughed fields. According to the type of their operating elements, levellers are divided into bucket and mouldboard types. Bucket levelers are used for thorough (construction) leveling, and mouldboard levelers for operating (routine) leveling. P-4, D-719, P-2.8, PA-3 (in Russian: П-4, Д-719, П-2,8 and ПА-3, respectively) type bucket levellers and VP-8, MV-6, GN-4 and VPN-5.6 (in Russian: ВП-8, МВ-6, ГН-4 and ВПН-5,6, respectively) type mouldboard levellers are manufactured. It is designed for smoothing the field microrelief before sowing or cutting check bunds for carrying out washing or additional irrigation. When hanging heavy BZTS-1.0 (in Russian: БЗТС-1,0) type spike-tooth harrows, soil harrowing can be performed simultaneously. They are supplied in two options arrangement: with frame of harrows VP-8A-1 (in Russian: ВП-8А-1) and without frame VP-8A1 (in Russian: ВП-8А1). If unitized with a tractor of drawbar category 4, it can operate with 8-meter-range option with full set of harrows (VP-8A-1) or with 10-meter-range option without harrows (VP-8A). It consists of a folding frame onto which operating elements of two types are fastened. When traveling over the field, the operating elements transport the topsoil in lengthwise and crosswise directions, filling the depressions of field microrelief and kneading soil clods. When working with harrows fastened on the harrow frames in single row allows loosening of the smooth-faced surface of field. To provide effective performance of the leveler, moisture in a soil layer up to 5 cm thick should be not more than 15%. The design of VP-8A is more enhanced than that of VP-8 as follows: harrow frames, side sections’ cylinders mounting brackets, push rods, draft poles, etc. have been strengthened. Some weld joints are replaced with bolted joints; this improves the maintainability and makes adjustment easier. Performance of VP-8A is 1.26 times that of VP-8. It is designed for smoothing soil microrelief for sowing of sugar beet and other industrial crops with simultaneous harrowing. 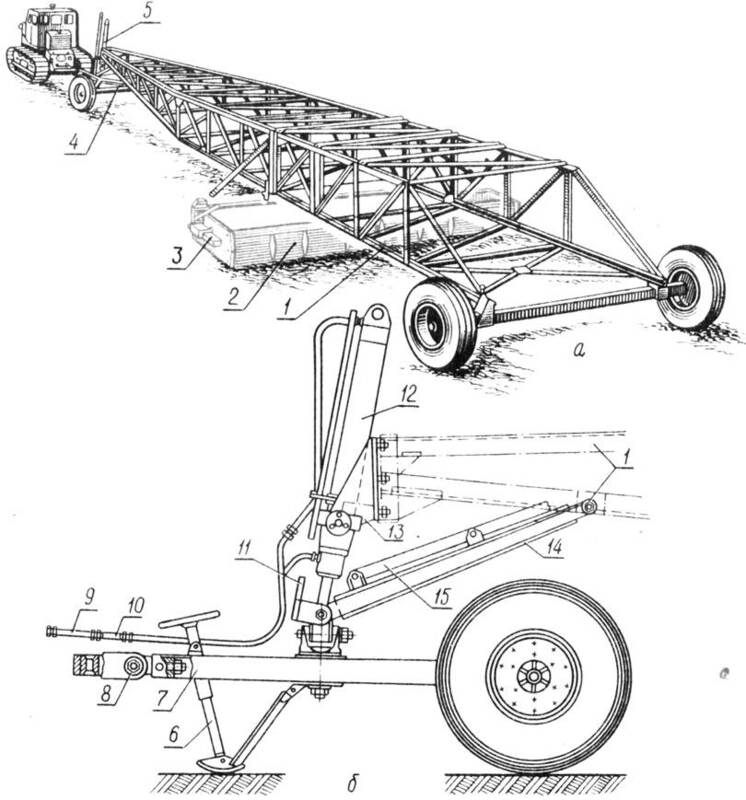 Major units: frame with a coupler lock; left and right sections; operating elements; section lifting mechanism; spring harrows; counterbalance. The operating element consists of six pieces of an angle steel of 100 x 70 x 7 mm mounted webs forward at an angle to the traveling direction. The angle of setting can be regulated from 70 to 90 degrees. During machine’s travel, its operating elements cut the soil from prominent irregularities and fill shallow depressions with it. It is unitized with tractors of drawbar category 3 by an automatic coupling device SA-2 (in Russian: СА-2). Served by the tractor driver. This machine is designed for soil cultivation for sowing of grains, industrial crops, vegetables and other crops. It consists of two rear and one front sections. The operating elements of each section are represented by: rotary spike tooth harrow; leveling beam; and ribbed roller. Spike tooth harrow is a cluster of spike stars slipped over the shaft freely rotating in self-adjustable bearings. The leveling beam is fixed on the frame and can be moved horizontally and vertically (the beam is spring-mounted; spring tension is controlled by chain works). The ribbed roller consists of geared rings and wedge-shaped disks mounted on the frame similarly to the stars of the rotary harrow. The frame of sections is made from square tubes and based on rollers. Its height can be adjusted by screw. A hitch tongue/frame is fixed onto the frame to connect the machine and the tractor. The aggregate can work both round and by to-and-fro method. For their removal over narrow roads, the sections are hooked up in tandem and the harrows are lifted by means of screws on supporting wheels. It is unitized with tractors of «Belarus» family, DТ-75М, Т-4А. It is served by the tractor driver. It is designed for operating leveling of the field surface. It is unitized with tractors of drawbar categories 3 and 4.